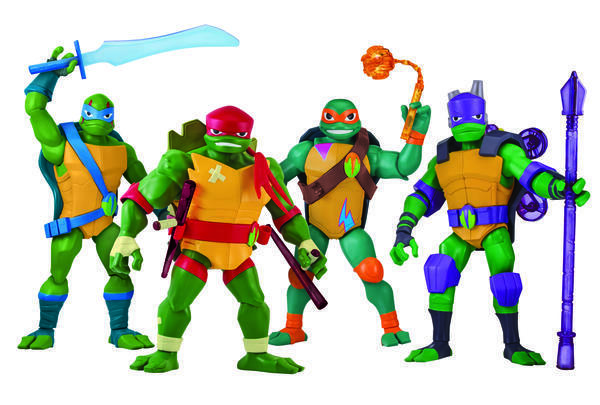 Rise of The Teenage Mutant Ninja Turtles Get Some Awesome Toys! Playmates have always produced a lot of merchandise for the Teenage Mutant Ninja Turtles and Rise is no different. 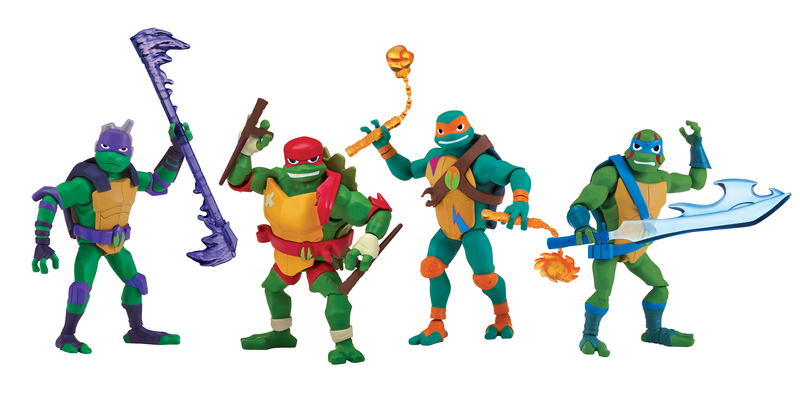 As you can see the turtles have all new looks and new weapons for this brand new series which are really bright and colorful with a really animated look which looks great! The Action figures will feature well detailed and accurate sculpts and plenty of articulation. They’ll also include character-specific accessories. In the assortment, you’ll get the four turtles, Splinter, April, Meat Sweats and Baron Draxum and other characters that’ll be in the series. There are four role-play sets, one for each of the turtles. 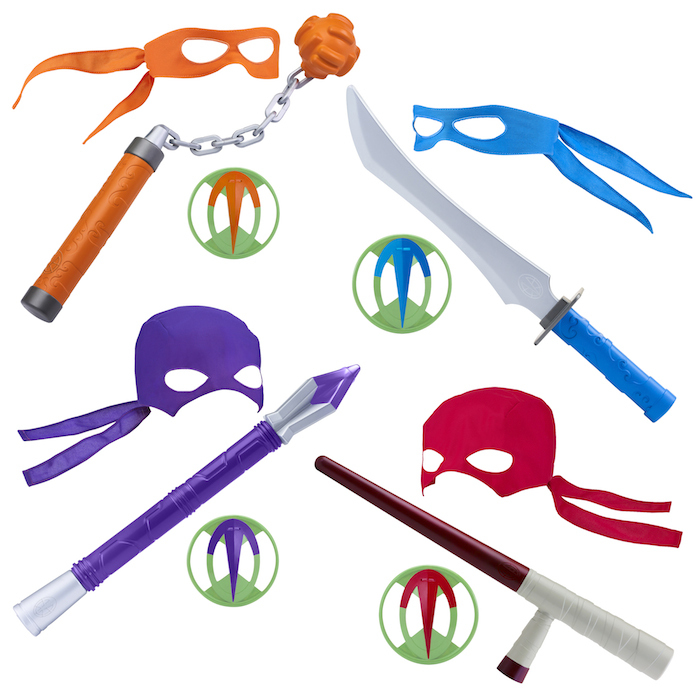 The set will feature the turtle’s signature bandana, weapon and throwing star. The Ninja action figures will be the four brothers with a flipping action feature, which is activated by making them bend over. Not only that when they flip they’ll release an action shout sound effect. The Giant figures will stand between 10.25″-11″ tall and will feature 13 points of articulation and look really impressive, as many figures on the retail market don’t feature that much articulation. So these will be must-haves for fans of the turtles. The Shell Hog bikes look pretty cool I do love the neon colors to these. They’ll have a rev up feature and of course, each turtle will have their own individual bike. 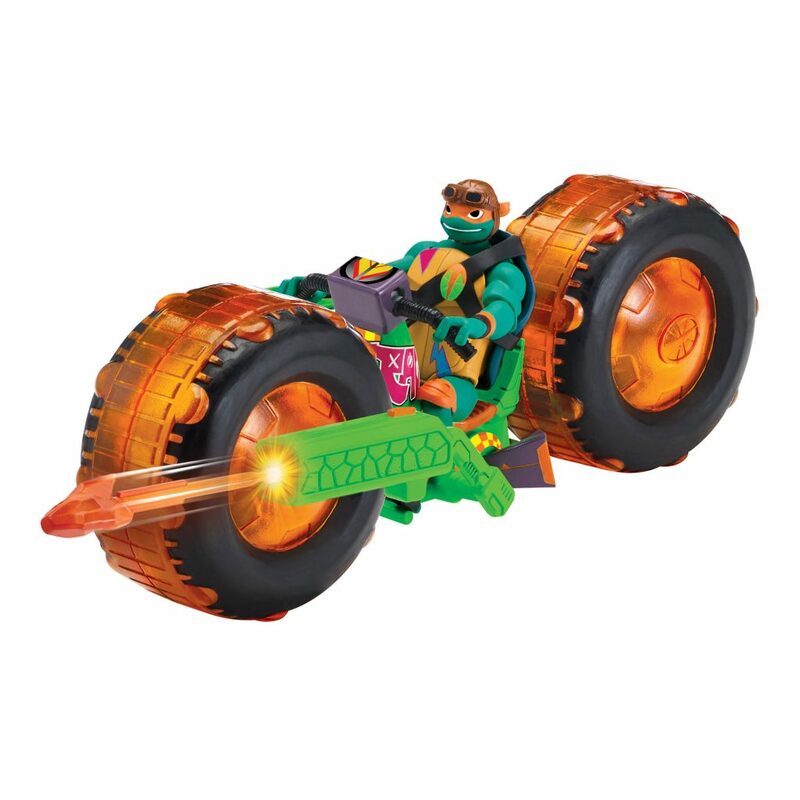 Not only that but you can attach the bikes and launch them together, but you can also launch them from the awesome looking Turtle Tank! The Turtle Tank looks absolutely fantastic. I’ve always loved the look of the group vehicles and this is no exception. 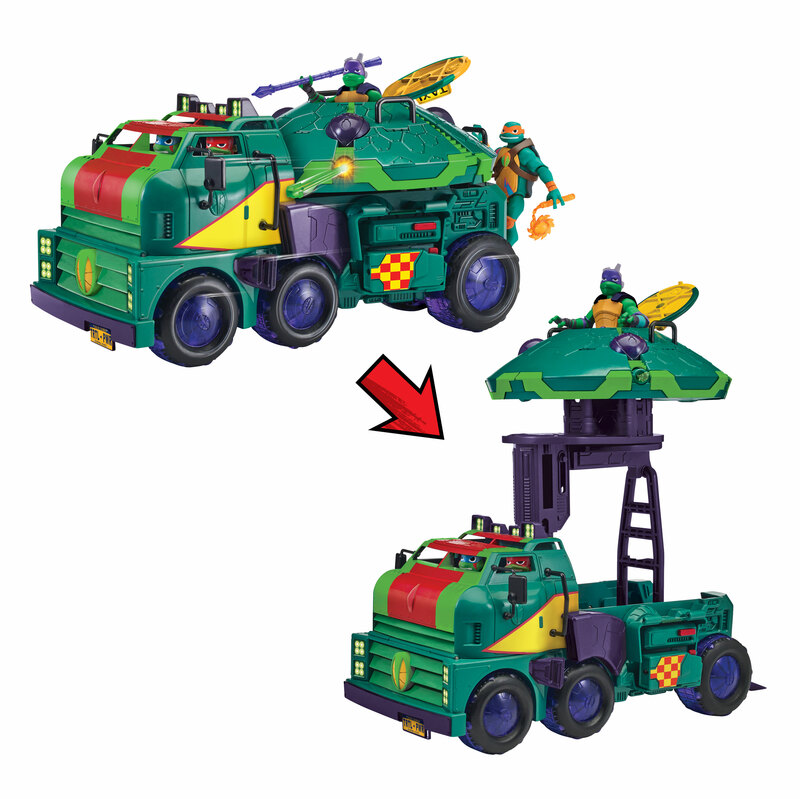 The Turtle Tank has a transforming feature which includes a secret lab tower for Donatello! 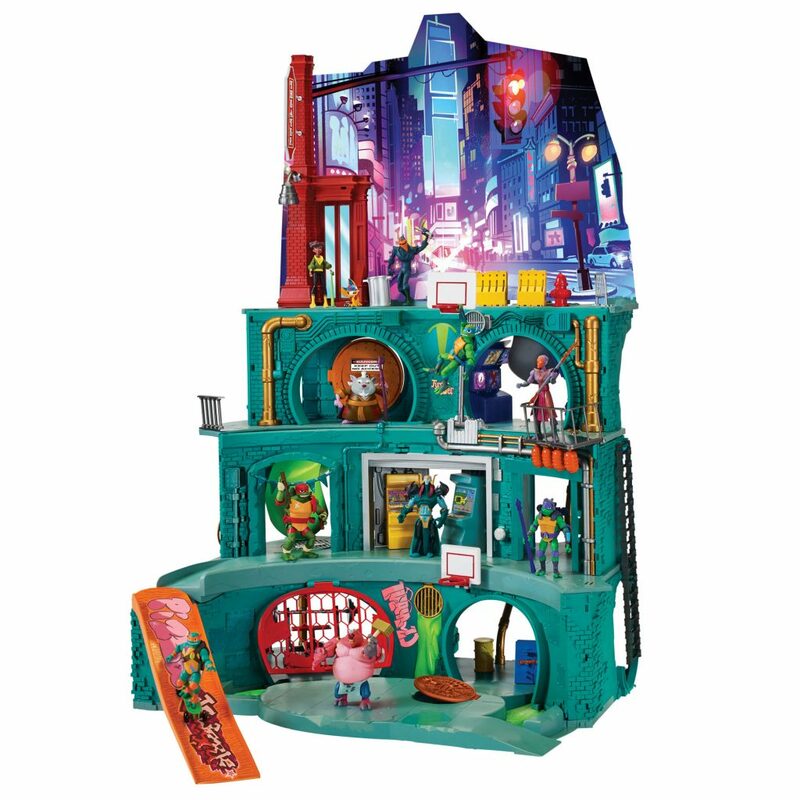 The real highlight of these new products has to be the 43″ epic play set! The set includes areas where the turtles would train and live. There are seven rooms from the sewer level to the NY diorama above. There are also 20 play features as well. I love the look of this set as it has a retro feel to it and the added arcade machines is a fantastic touch. Kids and collectors would have fun with this set for hours! That’s not all though Playmates are bringing back the Sewer Squad Pizza Points Loyalty Program which was featured in the late 1980’s line. 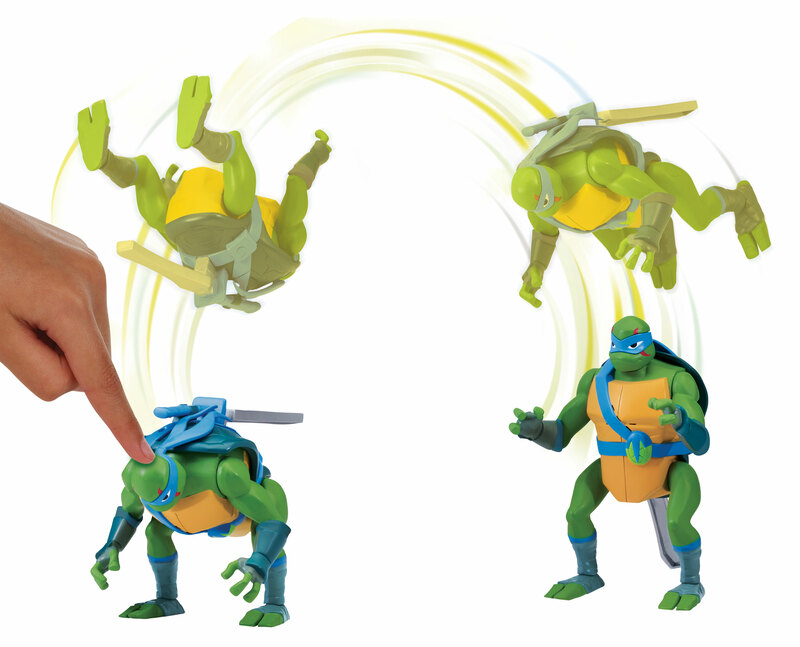 On each product of the Rise of The Teenage Mutant Ninja Turtle line, there will be a unique secret code printed on the packaging which you can enter on playmatesstore.com to get access to exclusive toys and other rewards. It should be noted that all these products will be available in all retail stores from October 1st. So if your a fan of the new series you don’t want to miss out!